The need for firestopping in our network and low voltage cabling world is important, yet fairly limited in nature. For everyone, a key challenge exists within the nature of the install: We penetrate a wall, ceiling, or floor to lay the cable, and then must somehow recreate the original fire rating of that structure. The ratings differ, too; 1- to 2-hour ratings are most common, but 3- to 4-hour ratings can also occur. Challenges present themselves from different perspectives, as well. As in installer, concerns about firestopping revolve around compliance, documentation, and cost-effectiveness. From the building owner's perspective, compliance is at the top of the list! Simple solutions are more advantageous, because no one wants to deal with the hassle of an elaborate permitting system for each and every penetration. So, what are the options, and what is the best way to resolve these challenges? Many rely on a firestopping method that uses conduit sleeve penetration. Here, cabling is installed, then backing material and caulk or putty are used as the firestop. 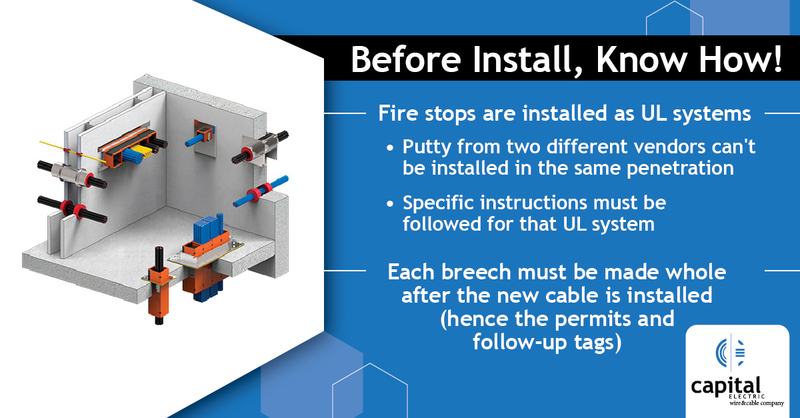 When following the particular UL system installation directions, a compliant system is ensured – however, while this method is inexpensive to install, it's not easily maintained for compliance. A better method is available, particularly for long-term considerations such as added cables and limited monitoring. Specified Technologies Inc. (STI) makes the EZ-Path® Fire Rated Pathway that allows cables to be pulled through the sleeve without applying new caulk or putty. The intumescent material is built into the sleeve system; in the case of a fire, these self-sealing pads expand to block flames and smoke. The great value for building owners is that EZ-Path sleeves allow for 0-100% visual fills – meaning that cables can continue to be installed until the entire usable space is filled. Of course, cables should never be compressed or squeezed into the sleeve as that distortion would cause the firestop system to fail, and a failed performance testing when installed. There is no shortcut or substitute for working with reputable installers who take pride in doing it right, and letting you know when a sleeve is at capacity. Capital Electric stocks the STI EZ-Path series; let us show you how this sleeve system can eliminate challenges for your next firestop installation.